Mayor Harry Rilling has chosen Norwalk’s new Chief Financial Officer, filling a hole created by the sudden departure of Chief Financial Officer Bob Barron in January. “I cannot release any details until we give the Council information. This is a position that is solely appointed by the mayor, but we want to make sure that we include the council so they can understand who we are recommending,” Rilling said in a late Monday text message. Rilling informed the Democratic Town Committee of the choice Monday evening, without naming the candidate. Barron resigned on Jan. 17, over what Rilling said were “workplace issues.” NancyOnNorwalk has reached out to Barron repeatedly but he declined to comment. Following Barron’s resignation, Norwalk Public Schools Chief Financial Officer Thomas Hamilton assisted the City’s Finance Department in formulating the 2019-20 operating and capital budgets. Hamilton was previously Director of Finance for the City of Norwalk. 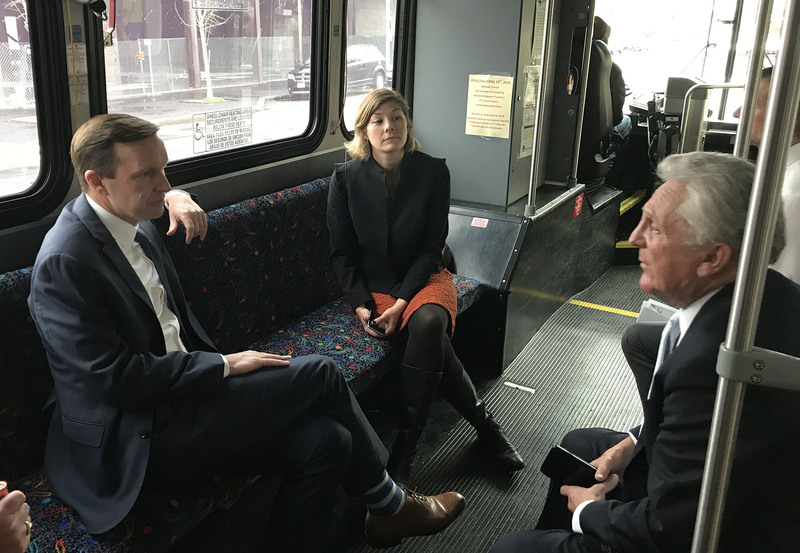 Rilling escorted U.S. Sen. Chris Murphy (D-Conn.) on an hour-long Norwalk Transit Bus tour Monday afternoon, according to a City Hall statement. “I got a helpful overview of all the different development projects happening, which will help me identify federal opportunities as we get into the budget and appropriations process,” Murphy is quoted as saying. Rilling and Murphy visited the Wall Street and West Avenue corridor, then traveled through South Norwalk and the SoNo Train Station, and onto Soundview Landing, the former Washington Village, for a discussion on affordable housing and Choice Neighborhood Areas. The Common Council Ordinance Committee is expected Tuesday to hold a public hearing on changes to the noise ordinance, which it has been working on for months. The Committee may vote on the changes and send them to the full Council. The Committee hired noise consultant Eric Zwerling, president of The Noise Consultancy, to help draft the ordinance. SoNo business owners have decried the proposed changes; minutes of the March 19 meeting show Attorney Leonard Braman protesting on behalf of bar Our House that a daytime-limit of 45 decibels and nighttime limit of 35 decibels are too low, and a 10 p.m. halt to music on weeknights too early. Isaac Patrick Camoro, Our House owner, said that liquor sales after 10 p.m. are the generation of the business’s profits and go into rent and taxes, according to the minutes. John Chu, a Washington Street resident, said that he had called police six times since January only to be told it’s not that loud. Chu said the common sense solution would be to cut the sound off at its source, not tell people to shut their windows and basically live in a cave. Activist Diane Lauricella, representing the South Norwalk Citizens for Justice, called it a health issue and an economic issue, and said that police shouldn’t be telling people that noise goes with the territory in SoNo. Lauricella sent a Monday evening email, alerting people to the public hearing. The hearing is at 7 p.m. Tuesday, April 16, in City Hall room A300, on the third floor, next to the Council chambers. You can review the proposed ordinance here. 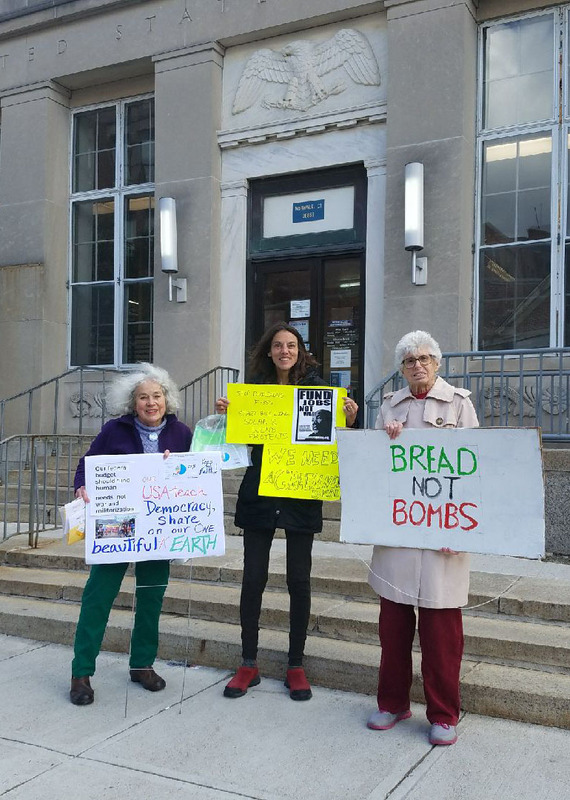 Maryteresa “Missy” Conrad, Diane Keefe and Virginia Auster protested military spending Monday outside the Main Post Office in SoNo. “Many taxpayers rushing to mail their returns voiced agreement. One walked quickly by yelling, ‘MAGA baby’ in disagreement,” Keefe wrote. 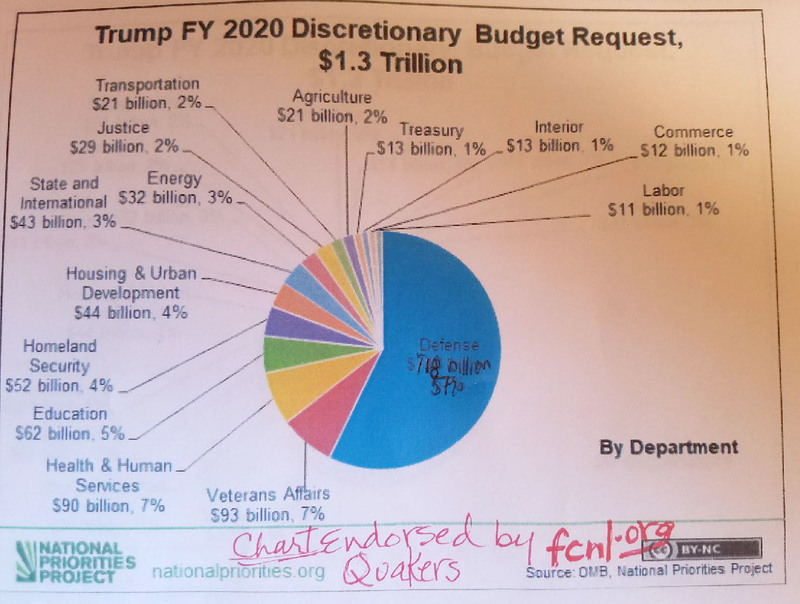 The trio of Quakers passed out flyers claiming that 57% of the country’s discretionary spending goes to the military, including $718 billion in the 2020 budget, Keefe said. The protesters quoted the late Rev. Martin Luther King and called for building fewer F-35 fighter planes and more of solar and wind projects. “Jobs from peaceful activities not war,” she wrote. “Our tax dollars need to be directed to solving the poverty and climate change problems of the world, not on financing more war making,” she wrote. Norwalk Democrats at their Monday DTC meeting collected $100 to support Stop & Shop workers, who have been out on strike since 1 p.m. Thursday. Some fear that the supermarket’s perishable food will go to waste. One NancyOnNorwalk reader who wished to remain anonymous alleged Monday that a Norwalk Stop & Shop sold him food that was past the expiration date. Stop & Shop has its roots in Boston and is organized into two divisions: Stop & Shop New England and Stop & Shop New York Metro, Ahold Delhaize states. “31,000 workers at Stop & Shops across Connecticut, Massachusetts, and Rhode Island have gone on strike,” the Connecticut AFL-CIO (American Federation of Labor and Congress of Industrial Organizations) said Thursday. The Stop & Shop strike “could jeopardize the chain’s turnaround plan and heap more pressure on its Dutch owner, Royal Ahold Delhaize NV,” Bloomberg reported Friday. The business news service described the labor action as the largest in the retail industry since 2003. Stop & Shop in a Monday press release said there’s “a lot of misinformation” on the health benefits it has offered workers. “Stop & Shop would pay at least 92% of health premiums for family coverage and at least 88% for individual coverage – much more than what other large retail employers pay,” the company states. Workers are upset that under the proposal their contribution towards health care benefits would in some cases more than double. I’m not a fan of Stop & Shop. The store layout stinks and it’s near impossible to find anything without circling around as they intentionally have designed it. If they had a more efficient floor plan and made it easier to find things they could probably attract more customers and improve their bottom line. How much do the workers think they can get? Do the union bosses who are being paid during the outage really care about the rank and file who are not being paid? Why would you continue to waste time striking your job at a poorly run company, when Stews and Whole Foods are right around the corner who pay better? Do the Stop and Shop workers think its their lot in life to pay union bosses when the company instead could use that money to increase salaries and benefits competitive with other stores? How is it that Stews can pay more when it’s workers aren’t organized? Again, I’m no fan of Stop and Shop, but it seems like the workers are in a lose lose scenario. The capital invested in Ahold will disappear if they capitulate to labor. No one will miss Stop and Shop. Is it me, or does anyone see the irony in this column of various stories about us versus them with the unrelated top story with a picture of two individuals set to collect millions of dollars in taxpayer funded post retirement pensions and benefits? Over the years, the consumer experience at Stop and Shop has noticeably deteriorated. The stores’ atmosphere bespeaks a disrespect for customers, suppliers, and employees alike. Still, the root cause of the strike is said to be HEALTH CARE COSTS. The ACA was enacted after months of discussion in multiple Congressional committees. As a means to provide universal healthcare without decimating the health insurers who constitute a bulwark of the U.S. economy, the act contained flaws, but it was a reasonable starting point which lent itself to future corrections/modifications. Unfortunately, Congress instead voted to nullify the act’s vital lynchpin-the individual mandate-while the President urges total repeal of the act, endangering coverage for many millions of citizens. When citizens’ very lives and well-being are threatened, they take to the streets. Obamacare/ACA one size fits all Medicaid expansion has held our nation’s healthcare options hostage. For all those who gained “free” health insurance under the Medicaid expansion, an equal to greater amount of individuals were priced out of the market. Hopefully the ACA will be deemed unconstitutional by the 5th Circuit in July and erase the stain and sorry chapter in our nation’s history. Socialism must be defeated and the power of the free markets need to be unleashed to make our healthcare affordable once again. Wowee, a hundred bucks. Come on DTC, step up. Any chance that law could enacted limiting US Senators to term limits? It’s basically a lifetime appointment. I feel for the rank and file at Stopen and Shop..However, has anyone stopped to examine how much union leadership is paid? It is much greater than I would’ve expected. Many leaders make upwards of $300k.Some make upwards of $500k! Maybe leaders should take less from their people? I am also amazed at dollars donated to politicians by this union.. The average Stop & Shop executive compensation is $236,860 a year.The median estimated compensation for executives at Stop & Shop including base salary and bonus is $237,646, or $114 per hour. At Stop & Shop, the most compensated executive makes $700,000, annually, and the lowest compensated makes $50,000. Maybe executives should take less from their people? Please post a link to what you claim union leaders at stop and shop make. Bridget P—Congress could enact provisions to correct the inequities that were caused by the original legislation. Instead, the lawmakers have simply tried-and failed-60 separate times to repeal an law that was intended to benefit all, a law based on the idea that healthcare is a right, not a privilege. Now it will probably end up being judged by the Supreme Court for the 3rd time. The site provided by John O’Neill contains quite a lot of data. I hope they talked about re-activating the Wall Street Train Station. A train station at Wall Street would be the single most potent economic development incentive for Norwalk overall and fits right in with the TOD grand plan. The Comparably site makes some very convenient calculations. No “top executive” works only 40 hours per week and so dividing compensation by that factor is highly misleading. Anyone in that capacity makes far less per hour, and that’s of course if you don’t count travel by car and plane, and overnights at hotel. Successful executives do not watch the clock.